I thought I would start a guide to the sounds and names you guys will no doubt hear yelled across dancefloors and whispered in sweaty inner city hipster tea house and coffee shops over the next year. Part 1 of this guide will delve lightly into the latest emerging sound in the dance scene, Melbourne Bounce. What is lovingly coined as the Melbourne sound is not really anything new in the world of dance, but just like the dubstep/brostep phenomenon, it has had a peak late in its life which will see its meteoric rise and subsequent fall in the next twelve to eighteen months. Clubbers in Melbourne will have no doubt heard the iconic sound, but the rest of the country is only just getting the sonic assault in the past 6 months or so and the rest of the world is only hearing it now. Generally loosely defined as big bass Electro house, there are a growing number of expert (and extremely young) providers of the bounce sound. A couple of big names in the sound right now are the very young Will Sparks and his older mentor Joel Fletcher. To put their rise into perspective, before the release of any single or original content, Sparks had almost 50,000 followers on his facebook and soundcloud account which was double the number Flume had on the release of his award winning self-titled album which won him the best male artist at the recent ARIAs. Sparks went from bedroom production to touring Australia and the US in little over 6 months which shows how hungry the scene has been for the next big thing after dubstep. Fletcher is presently sitting in the top ten overall charts with his remix of New Zealand rapper and Dawn Raiders elite Savage’s 2005 hit Swing. Sparks and Fletcher have held top five positions in the overall Beatport charts several times now and that’s no mean feat with the likes of Calvin Harris, Hardwell and Laidback Luke routinely dropping the Melbourne sound in their international sets catapulting the young Australians into the spotlight. 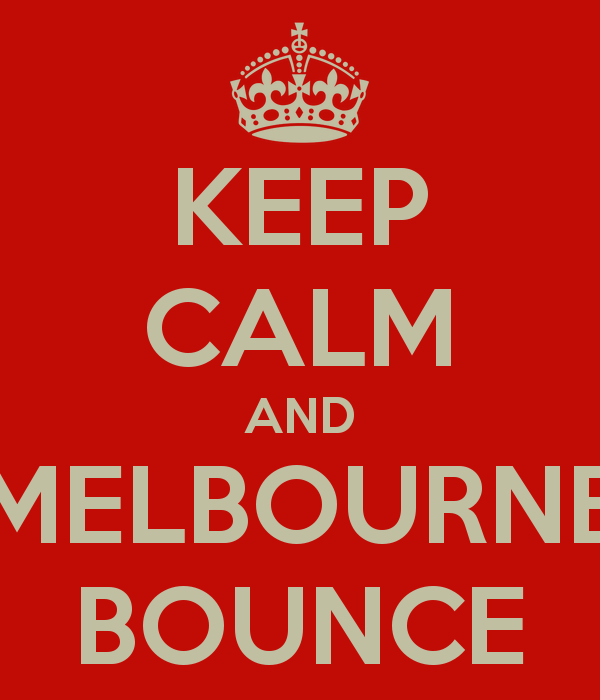 Melbourne bounce is a minimalist style of electro house, with syncopated pulse 3XOSC basslines often accentuated by muted 808 and 404 tones with this overall encompassing inverted phase kick with no bottom. Its hard style 128BPM kick constantly drives the tracks which sometimes contain angelic vocals, but more often than not contain filthy dirty screams, moans and wails. Another main feature seems to be the over exaggerated use of female orgasmic noises and expletives. Other notables in the scene right now are the nice guy antics of Timmy Trumpet and their frequent collaborators Uberjak’d and SCNDL. Probably the biggest of recent note is the harder to listen to and equally scandalous group Bombs Away who headlined the Gold Coast 600 recently and have handled several of the Australian releases under Ministry of Sound’s Annuals. But in the sincerest form of flattery, you know you’re onto a winner when the likes of Knife Party even drop the Melbourne Bounce craze into their ever expanding repertoire or tasty goods. Their bounce track LRAD dropped on the last Haunted House EP and probably did more for the sound than anyone else combined.